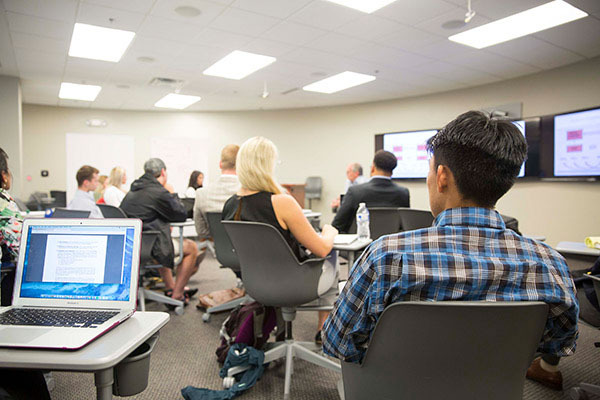 Learn the language of business with a major that has plenty of career potential. Organizations are looking for well-rounded leaders who can provide solutions, unique ideas and positive outcomes. We'll make sure you gain the outstanding academic credentials you need to sit for the CPA exam. Our program emphasizes financial reporting, financial analysis, international business and management decision-making. Learn from accounting faculty with decades of experience in firms and in-house accounting departments. Develop your professionalism with internships in Nashville. Learn to think globally by studying abroad with your classmates. We have long-standing partnerships with some of the largest firms in the U.S. So become part of one of the most respected programs in Tennessee. With our 100 percent job placement rate, you can rest assured you'll get the job you want and need. Must complete a part-time internship (20 hours a week) for academic credit. We designed this curriculum to provide BBA students a well-rounded business education including four foundational upper-division accounting course: Intermediate Accounting I and II, Federal Income Taxation, Principles of Auditing. BBA students admitted to the 30-hour Master of Accountancy (MAcc) will learn advanced accounting topics in great detail. EC 2413 and MA 1113 are also included in the general education requirements. A grade of “C” or higher is required for all upper-division accounting courses included in the major. The course must be re-taken if a grade lower than “C” is received.